Dog Paw Vertical Wall Mount Mailbox with Bone Trim is a beautiful mailbox for the dog lover - such wonderful entry decor for the dog lover home or business! A piece of art glass is mounted behind the Dog Paw Print and Bone design to highlight it - this is truly a dog lover's dream mailbox! 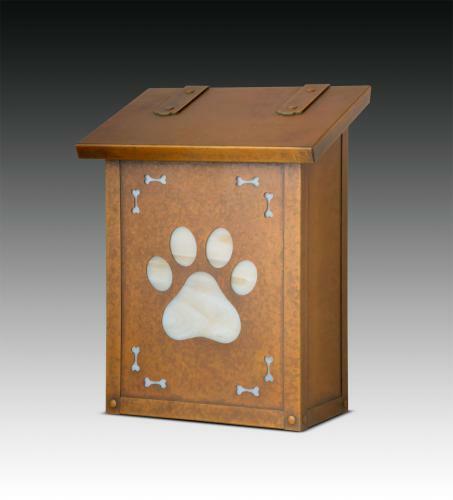 Our Dog Paw Vertical Wall Mailbox is handmade of solid brass - in the beautiful craftsman style - and has a traditional hinge detail on the lid and a rubber bumper inside to eliminate any noise when closing. The corner rivets complete the design and give this mailbox it's rugged handcrafted look. Easy to mount and a wonderful addition to your front entry - the Dog Paw and Bone Mailbox will be a delight for years to come. The ideas are endless for the many uses of this mailbox at the home or business of the dog lover!